Pictures can be inserted (or copied) into Office documents from your Mac. You can also replace pictures in Office documents. Click the location in your document where you want to insert a picture. Select the option you want to use for inserting pictures. The Photo Browser option helps you browse through existing photo sets on your computer, such as photos in iPhoto or Photo Booth. Picture from File lets you browse through your computer's file structure to look for photos. When you find the picture you want, drag it from the Photo Browser into your document, or click Insert in the file browser. 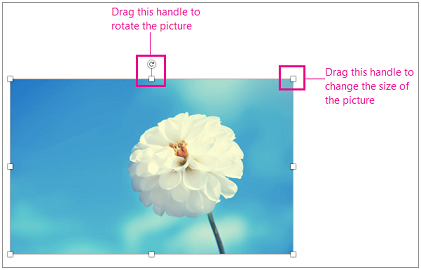 Tip: The picture is embedded in your document. If your picture has a large file size and makes your document too large, you can reduce the size of your document by linking to the picture instead of embedding it. In the Choose a Picture dialog box, select the Link to File box. You can insert a picture or photo into the body of an email message, instead of attaching the file. Inserting a picture requires that your message uses HTML formatting. To set HTML formatting, select Options > HTML. In the body of your message, click where you want to add a picture. On the Message tab, click Pictures. When you find the picture you want, drag it from the Photo Browser into your document, or click Open in the file browser. Resize the picture if necessary by clicking one of the handles that surround the picture and dragging it. Click the handle at the top of the picture to rotate it. Hold down CONTROL and click the picture, and then click Change Picture. Locate a new picture on your computer, and then click Insert. On the Home tab, under Insert, click Picture, and then click Photo Browser or Picture from File. When you find the picture you want, drag it from the Photo Browser into your document or click Insert in the file browser. The Photo Browser helps you browse through existing photo sets on your computer, such as photos that you have in iPhoto or Photo Booth. Click the Photos tab , and then drag the picture that you want into your document. On the Insert menu, point to Photo, and then click Picture from File. Locate the picture that you want, and then click Insert. You can insert a picture into a message so that the picture is part of the message, not an attachment. On the Message tab, click Picture. Click the Clip Art tab , and then drag the picture that you want into your document. Drag the picture that you want into your document.